After Band-Aid, comes Soft Aid, brainchild of Rod Cousens of Quicksilva. The project has already won the seal of Bob Geldof’s approval and is being supported by quite a few of the major names in the software world. 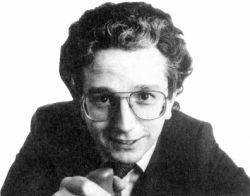 A package of games is due out this month, which will include music from the Band-Aid ‘Feed the World’ record and ten recent best-selling Spectrum programs. All this for £2.99 means it’s good value and the fact that proceeds from the package will help the Ethiopian Appeal should make the Soft Aid compilation pack a must. It seems that an air of naughtiness has pervaded the Computer Trade Association this year, or at least their agents. Turret-Wheatland, publishers of Leisure Electronics Trader and organisers of the LET ’85 International Trade Show which takes place this month, dropped us a line the other day congratulating us on our nomination for the Computer Trade Association’s annual awards. ‘How sweet’, we thought, ‘... wonder what category we’ve been nominated for?’ A phone call or two later, we learnt that we HADN’T been nominated for anything. Coincidentally, we heard that another firm which was taking a stand at the exhibition, like us had been told they had been ‘nominated’ for an award and invited to the £18.95 a head beano ‘... to hear the announcement’ etc. Oddly, they too had checked, this time with no less than three people at Turret-Wheatland, and had also been told that no, after all, they hadn’t been nominated for an award. Begin to smell a Roland somewhere? One is left wondering how many people on the exhibitors mailing list for the LET ’85 show were ‘nominated’ for an award — and more interestingly, how many coughed up the greater part of two hundred quid for a table at the dinner in the belief that they stood a chance of picking up an award. We hereby nominate Turret-Wheatland for the CRASH annual awards, and would be happy for them to join us for a pie and chips pub lunch in Ludlow to hear our announcement of the award winner — and be here to collect their award if they should be a winner. 6 Tickets for the CRASH Award Pub Luncheon are available to award nominees at £13.50 each, and a table at our local may be booked at the all-inclusive price of £135.00 for ten. THESE PRICES INCLUDE A HALF OF OLD ROTGUT’S FLATULENCE BITTER AND COMMEMORATIVE BEER MAT. All bookings should be made, in writing, to our Mr Cunningman — cheques made payable to the CRASH Slushfund, No 1 account. The CRASH team will be at the LET ’85 show, probably existing on sandwiches despite Turret-Wheatland’s efforts, and we’ll bring you news of all that’s new and wonderful at the show in our April edition. Somehow, I doubt we’ll be publishing a list of the CTA awards winners. We’re nit-picking really, and it sounds like a brill game what with familiar characters like Dave and Ricott together with a cast of thousands. But Arfur scurries around in his trusty ‘Merc’ in the Dk’tronics version, according to the blurb — and we all know Arfur drives a Jag/Daimler don’t we? IT’S THE OLIVER FREY SHOW...! Good news for Oliphiliacs! Our illustrious Art Editor, Oliver Frey is mounting an exhibition of his original work for CRASH (and a few other people) in the Silk Top Hat Gallery in Ludlow. Running from 1st to 22nd April, it provides a rare chance to view the CRASH covers in their original, giant-size form, without all those words Roger (you know — dash Ed) Kean insists we must put on them, like the price and what’s in the magazine — as if you weren’t going to read the magazine for yourselves, I mean really, sometimes Roger can be . . . aargh! Dk’tronics, on the other hand, have hired a couple of Currah’s research and development staff and now own the rights to make ex-Currah products for as long as they like. ‘We’ve bought the Currah trading name, intellectual property, tools etc. and will continue to sell and support the products as long as there is a marketplace’ says David Heelas, Dk’tronics’ MD. 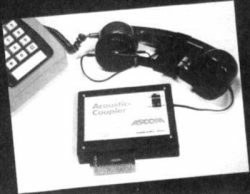 Telephone receivers aren’t all they’re talking about down at Prism, whose 1200/75 baud modem for the Spectrum was recently reduced to £69.95, for the company has sadly gone into receivership — which has already sent a few ripples round the industry. Modems are certainly becoming à la mode for the Spectrum, with the Unicom modem — renamed the Demon — due to have Spectrum compatibility any day now. We’re currently trying to coerce our in-house hardware guru, Franco, to have a look at this area of activity, and with luck we should be able to report back soon. Meanwhile, here’s a picture of an acoustic coupler sent to us by Dynamics. They tell us that it should be available for the Spectrum within a few weeks. Sadly, they didn’t date their letter, tell us the price or give a phone number so’s we could ring and ask ... further details, as and when they become available. Automata may be non-violent, but they’re certainly offensive. On the offensive, that is, for Croucher and Penfold the Torvill and Dean of mud wrestling write to tell us that they have just launched a wittily named ‘10 PACK’ on sale for £10. Crusoe, Piromania, Olympimania, Yakzee, Morris Meets the Bikers, Dartz, Pi-Balled, New Wheels John, Pi-in ’ere, and Pi-eyed are all included in this compilation, offered as part of the Automata Spring Offensive. Has the little pink-nosed fellow lost his marbles? Too much brandy and suffrage for Croucher? Full details will no doubt be revealed by the boys in Portsmouth... how long can this lunacy last? Get in quick, while the going’s good. Anyone with a desire to learn all about those stringy bits which make up the average human body — or keenies swatting for Human Biology — will be interested in the new six-pack of programs (available on a single tape and accompanied by a colour booklet) called The Living Body. Martech have involved Dr Christiaan Barnard as consultant on the project — which probably explains why one title in the series is called ‘Heart Operation’. Hopefully, there won’t be too many blood-stained Speccies as a result of DIY heart transplant attempts prompted by the programs. £19.95 for the complete package. Confusion may surround the present status of that cunning little device, the SLOMO, made by Nidd Valley Micro Products, not least because we told you that Cambridge Computing had gone to the wall last issue. Cambridge, however, were only making the SLOMO on behalf of Nidd Valley Micro, who are alive and well on Thistle Hill, Knaresborough and who will be happy to continue supplying SLOMO’s at £14.95. If your joysticks can stand the pace of another bashing, Decathlon freaks will be delighted to hear that Ocean is launching a follow up called Daley Thompson’s Super Test in May. It will feature 10 more popular events including cycling, swimming, canoeing and clay-pigeon shooting. The Spectrum version will be priced at £6.95. If you’ve ever dreamt of owning your very own arcade machine, coughing up £6.95 for Incentive’s new release — Moon Cresta — would be a good move. 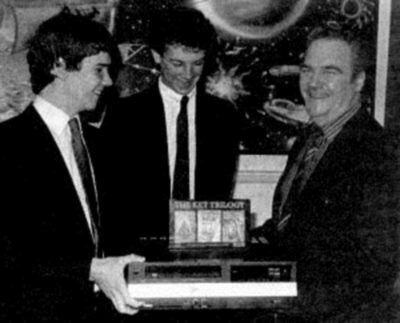 Moon Cresta’s already a CRASH SMASH (see Page 20), and Ian Andrew, the big cheese at Incentive — pictured here handing over a shiny new video to Tom Frost, winner of their Ket Trilogy competition — tells us that yer actual Moon Cresta arcade machine, as made by Nichibutsu, is now up for grabs. Anyone who achieves a score of 30,000 on the game can use the entry form on the cassette inlay to take part in a draw for the machine, which should take place towards the end of this year. Plenty of time to practice too ... nice fellows, this Incentive crowd. Unfortunately, our review of Loderunner, by Software Projects was wrongly priced. Oops. Software Projects are really selling Loderunner for £9.95. It wasn’t our fault really dept ... Derek Brewster reviewed Curse of the 7 Faces recently, and credited it to Artic. This wuz wrong, because Imperial Software are the people bringing it out. Artic tell us that they were inundated with good programs, and decided to share some of them with Imperial... watch out for a sneak preview of Artic’s latest effort, coming soon. Our erstwhile strategist, the very lovely Angus Ryall, undaunted by the long trip from London on his damaged motorbike, staggered into the CRASH office for an early lunch at 4pm the other day with a fistful of new releases from Games Workshop. None of them was totally completed, but all were in a viewable state. Talisman, designed by SLUG, is based on a Games Workshop board game and can be played by between 1 and 4 players in any combination against the computer or not. Through 50 locations split into three sectors, players must build their skills in order to beat each other and the final test of strength. It is a sort of graphical arcade/adventure where each player can wander around the varied locations until something interesting or useful is spotted. Stopping in a location will cause an event pleasant or unpleasant to happen. These events together with collected objects or computer characters add to the skill of the player under the headings Strength, Craft, Lives, Gold and Spells. Chaos by Julian Gollup (a member of SLUG) is a game of spell casting for up to eight wizards in any combination against the computer. Each wizard is allocated some spells to begin with and then appears as a character on screen along with the others. In turn you are allowed to choose a spell from your list and cast it either for real or as an illusion. Real spells have a percentage chance of successful casting while illusory spells always succeed, but can be destroyed if another wizard uses his Disbelief spell against them. Once cast, the spell appears on screen and all cast spells can be moved towards other wizards or their spell characters according a movement range table, and then fired at the opposing characters if they are in range. Spells have different strengths and may fight it out for a few rounds before one explodes. The object, of course, is to destroy all the other wizards. Also under the program loader name of ‘Talisman’, Angus showed us a new graphical adventure which, until a more suitable release name comes along, they have temporarily named ‘Hobbit’s Revenge’. This is written by a school teacher called Alan Davies and boasts around 3000 locations with lots of graphical views. Superficially like Lords of Midnight in appearance (it uses a form of landscaping), this game has more memory in it devoted to the adventure text. In it you control three characters and the game operates in real time. Objects and buildings can often be seen in the views yet not mentioned in the text description. Movement towards something seen has to be carefully and logically planned to end up at the building’s location whereupon it appears in the text. These three games should be out within days of you reading this, together with Key of Hope, the follow up adventure to Tower of Despair, and one other, which may be released as the first ever Games Workshop budget game, is temporarily named ‘Bazam’. This is a ‘Battlezone’ tank game with relatively simple 3D graphics which allow for very fast scrolling, making it the fastest ever game of its type. Features include various tanks, armour (shields) and a firing range.